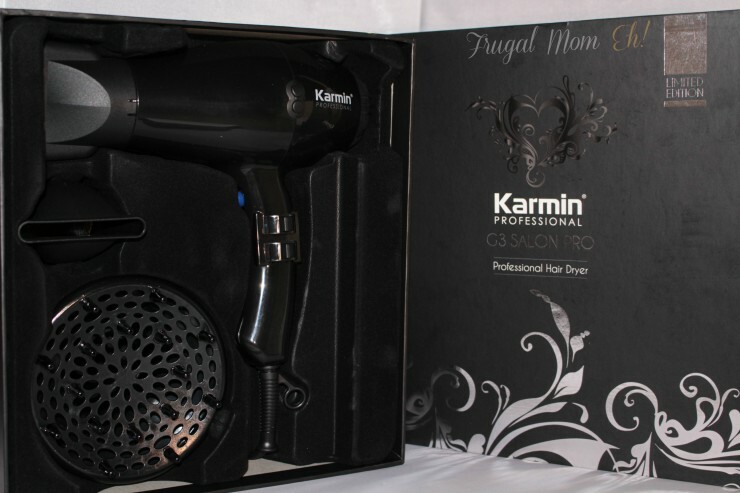 Karmin G3 Salon Pro Hair Dryer Review - Frugal Mom Eh! Hair styling is serious business for me. I’ve learned that it is so much better to invest in good equipment for the quality and life than to buy cheap new flat irons, curling irons and hair dryers all the time. Not to mention the drastic difference in styling time for my long, thick, curly hair. When I look for heat styling equipment I want a tool that will work quickly because the last thing I want to do is spend over an hour styling my hair with a Toddler (and soon an infant) in need of my attention. I was sent a Karmin G3 Salon Pro Hair Dryer to check out and boy am I ever impressed! I generally only use hair dryers to dry my hair prior to straightening because the ones I’ve tried before just never gave me the look I wanted whether it be straight or to bring out my natural curls. They never seemed powerful enough or hot enough to get the job done despite the fact that my hair stylist uses a hair dryer to straighten my hair and it always comes out perfect and soft without having to use any styling products. The Karmin G3 Salon Pro Hair Dryer features an incredibly powerful 2000 watt motor with 3 temperature settings and 2 speed settings and a cool shot button. The motor is definitely powerful and puts out some serious wind-speed, putting an incredible dent into my styling time which is impressive considering how thick my hair is. It also contains ceramic coils which maintains a more even temperature for healthier styling. This is really important to me as my old dryer left my hair looking like a giant frizzy ball and feeling like straw. With the Karmin G3 Salon Pro Hair Dryer, my hair is left feeling like I have just left the salon. It also comes with a diffuser and 2 narrow nozzle attachments. The diffuser itself is simply amazing. It’s nice and large and gets the job done properly leaving my hair looking glossy curly rather than frizzy and wavy. The nozzles worked well in combination with my ceramic brush to get my hair looking naturally straight and shiny. To back up Karmin’s claim of a long-life, the dryer also comes with an amazing 3 year warranty. This is a nice little bit of reassurance for anyone who may be a little hesitant over the price point. I definitely recommend the G3 Salon Pro Hair Dryer, especially for women out there like me who find hair styling a daunting and lengthy process thanks to their hair type and inferior hair styling equipment. This hair dryer will change your life by freeing up precious time! The Karmin G3 Salon Pro Hair Dryer retails for $189.95 direct through Karmin and only $159.95 through Beyas! What a wonderful product! Although A bit pricey for me! A good hair dryer is such a great investment! I’ll keep Karmin in mind when my current hair dryer needs to be replaced. I like the different temp settings. I have been using the same hair dryer forever ! This sounds like a great replacement. This sounds like a great dryer, I am looking for a new one but I think this one might be a little out of my budget. Maybe I can ask Santa for it? The Karmin G3 Salon Pro Hair Dryer sounds like a really good dryer. It has a strong motor and different heat settings (always a plus). I need a good one otherwise my hair looks like a frizzy mess. I recently purchased a professional flat iron and a hair dryer is next on my list. With the flat iron the quality is uncomparable to a cheap one, I can only imagine it is the same for hair dryers. A good hair dryer is an awesome investment! It will save you time and money in the long run. This one looks great! I also have very thick curly hair, and if there was a way I could get just from the salon hair, I might consider paying this much for a blow dryer. I hate to blow dry my hair because I feel like it damages it. If this hair dryer dries my hair faster and makes it look awesome, I am all for it! Thanks for this detailed review! It may be a bit pricey compared to other brands, but for those who use a blow dryer regularly, this is a good investment. I currently have the Karmin dryer and it works really well for my hair.